Once you have logged in, you’ll be taken to the Documents page. You can use this page to navigate and manage your documents and folders. Document List on the right. The contents of the folder you select in the Folder Menu on the left will be displayed in the Document List on the right. Group account users will also have access to a Folder Menu called Shared Folders. This is a place where users on the same account can share their documents with each other. Click the ‘Create a Document’ button to open the editor and start writing a symbol document. Click the ‘Create a Grid’ button to open the template selection menu to create a symbol grid. When you save a document, it will be saved in the folder that you were in before opening the editor. Select Tick the check boxes to select files. Title / Title Click the title to open the document or grid in the editor. Rename Click the 'Rename' icon to rename your documents and folders, or to choose an symbol icon for them. View Click the 'View' icon to read your document, listen to it and print or publish it. View PDF Click the 'View PDF' icon to see your document in a PDF format that can be printed. Click the 'Download' icon to download SymWriter documents to your PC for use with SymWriter 2. You can also download grids for back up purposes or to transfer them to another account. Published Displays an icon for published documents. Last Modified Shows the last time that the document was edited. You can also use the buttons above the Document List to perform various actions on your documents. Group account users may find that they cannot perform all of these actions when accessing documents in ‘Shared folders’. This will depend on the folder permissions granted to the User by their Manager or Administrator. 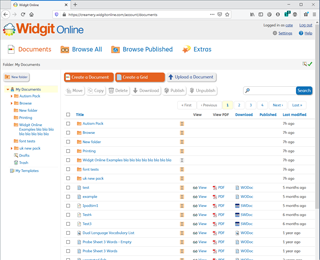 Widgit Online has an autosave system that automatically saves your documents while you are writing. This means that if your browser unexpectedly closes, or you are disconnected from the internet during a writing session, you can recover most of your work. The autosave system frequently saves copies of the document you are working on to your Drafts folder. When the document is being autosaved, a small notification will appear in the editor. If you have to close a document before you can save it, or you don't have a chance to save it at all, you can find the most recently autosaved version in the Drafts folder. Documents in the Drafts folder are named with the date and time when they were automatically saved and the original filename. If you hadn't given your document a name yet, the 'draft' version will be named with the first few words of the documents. You can open documents in the Drafts folder by clicking on their names, then continue writing or save normally. If you have saved a previous version of the document, saving the draft will replace that file. If you don't want this to happen, choose to 'Save As' and give it a new name. If the draft was of a new document, you will be prompted to give it a name when you save it.